You must pay for your own Domain Name through GoDaddy.com. JH Web Designer can help you out in researching and obtaining your domain name for you. After your domain name is established, JH Web Designer will need access to it, so that we can link your domain name to our server. When you pay $799 upfront and in full, you will receive a $200 dollar voucher via email, covering Website Updates or Graphic Design work to use at a later point after the initial project is completed. * Renewals will take into effect 1 year to the date when your website is completed and up and running. You will receive an email indicating when your renewal date is for your Web Hosting and SSL Certificate with JH Web Designer. 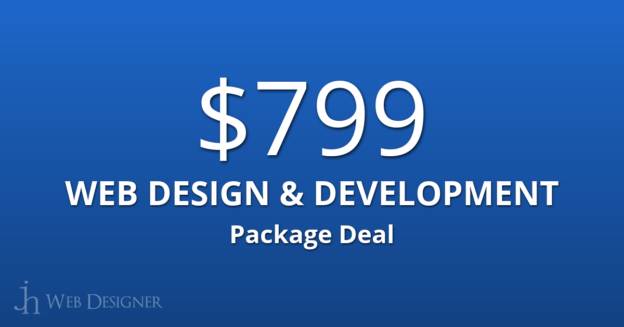 Before filling out the following form below, if you have any questions regarding the $799 Web Design & Development Package Deal, please call 316-842-4906.